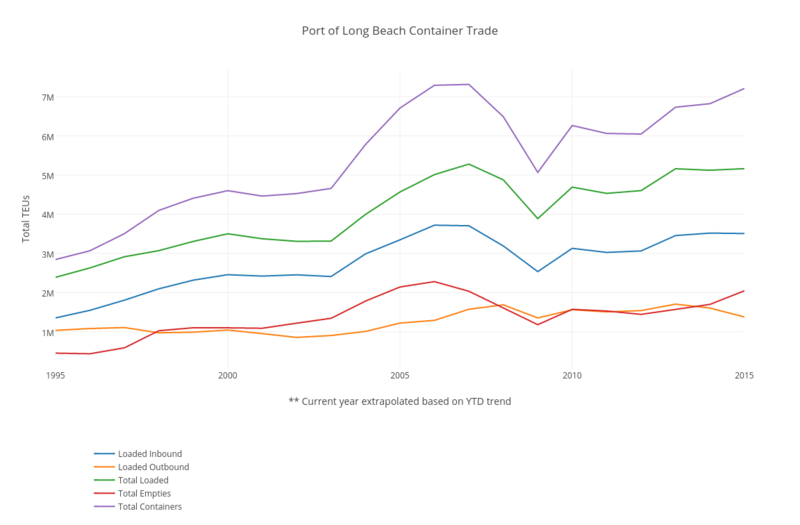 While the ports of Long Beach and Los Angeles have trends that are somewhat at parity with one another, they certainly do not necessarily move in tandem. Which is probably the self-obviating point of different cargo. That said, I thought it would be interesting to plot the last twenty years of activity for the two ports. 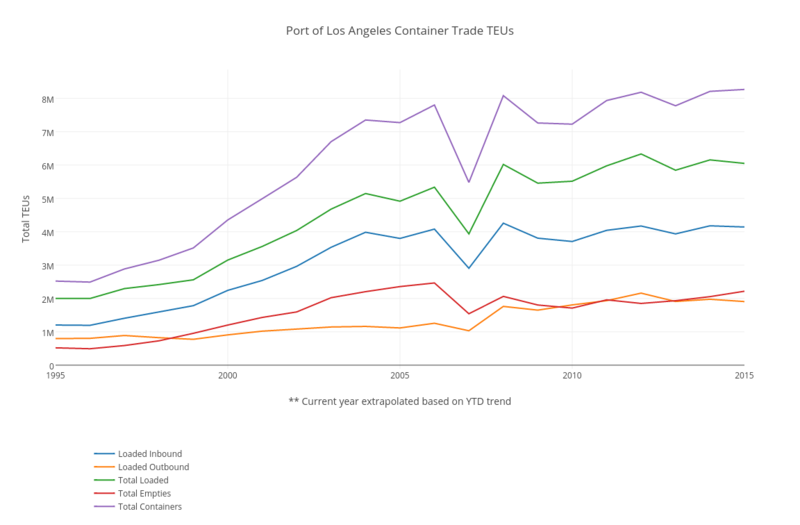 The Port of Los Angeles gets a little more granular with their posted statistics, but for the purpose of comparison, both data sets for the two interactive charts were set up consistently. 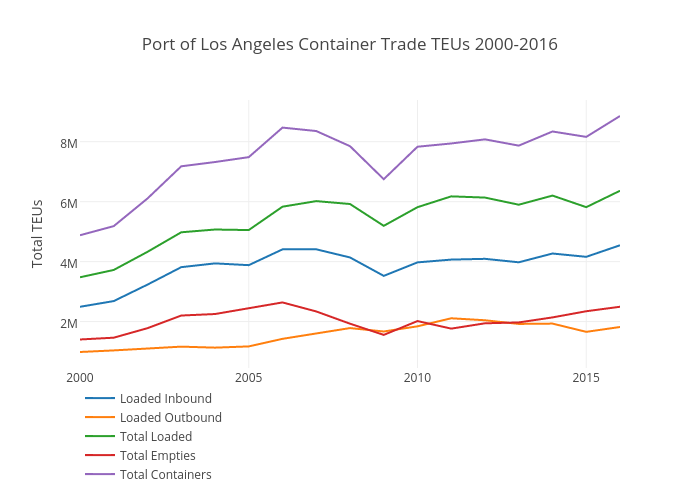 Containerized cargo volumes edged up .8 percent compared to the same period last year. The Port handled a total of 694,791 Twenty-Foot Equivalent Units (TEUs) in May 2015…Imports decreased .8 percent, from 351,403 Twenty-Foot Equivalent Units (TEUs) in May 2014 to 348,427 TEUs in May 2015. 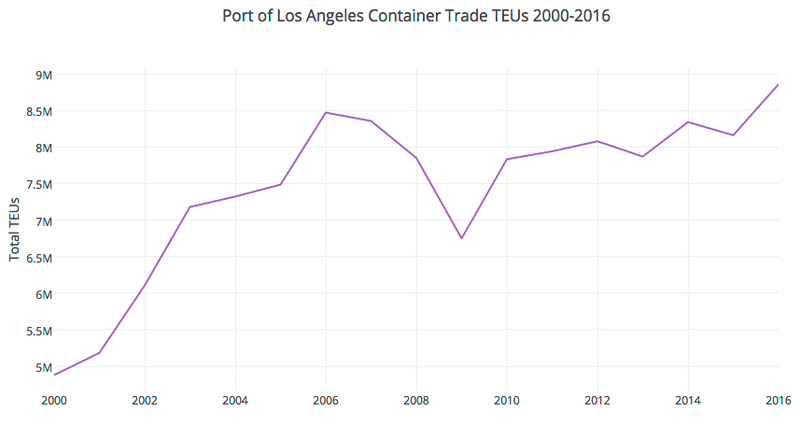 Exports declined 3.5 percent, from 158,473 TEUs in May 2014 to 152,917 TEUs in May 2015…Factoring in empties, which increased 7.9 percent, overall May 2015 volumes (694,791 TEUs) increased .8 percent. For the first five months of 2015, overall volumes (3,181,718 TEUs) are down 4 percent compared to the same period in 2014. 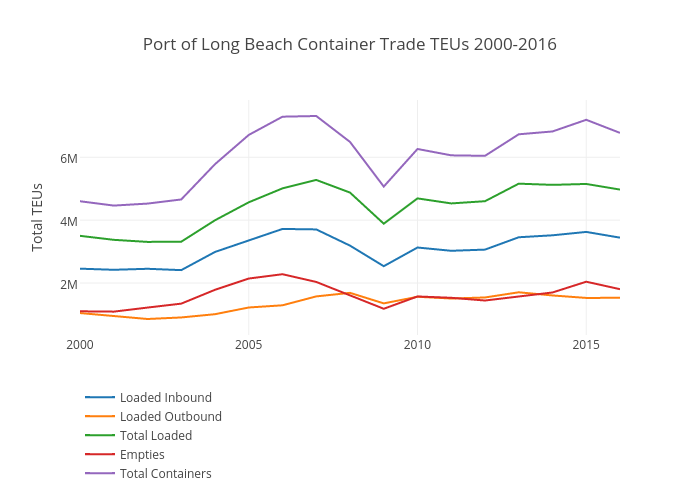 Cargo rose at the Port of Long Beach by 6 percent in May, the third consecutive month of growth, the busiest month since October 2007, and the busiest May since 2006. A total of 635,250 TEUs (twenty-foot equivalent units) of containerized cargo were moved through the Port in May. Imports numbered 327,317 TEUs, a 4.8 percent increase from the same month last year. Exports decreased 7.4 percent to 135,855 TEUs. Empty containers rose 22.6 percent to 172,078 TEUs. With imports exceeding exports, empty containers are sent overseas to be refilled with goods.